It was Mother’s Day in the UK recently and this year, and I decided to bake some chocolate chip cookies for my mother-in-law and my husband’s Nanny. Nanny unfortunately has been really poorly and the day before Mothering Sunday here, we drove to see her with my husband’s family. I’ve never made chocolate chip cookies before and I decided to try and make one of Nigella Lawson’s recipes – her Totally Chocolate Chocolate Chip Cookies. Personally, I think they’re way too sweet! Her recipe called for 350 grams of chocolate chips (!!!) but I didn’t have that much so I only had 300 grams and they were a mix of milk, dark and fudge chips. The fudge chips probably didn’t help but even if I’d stuck to dark chocolate chips, I think these cookies were just too much of a sugar overload for me. 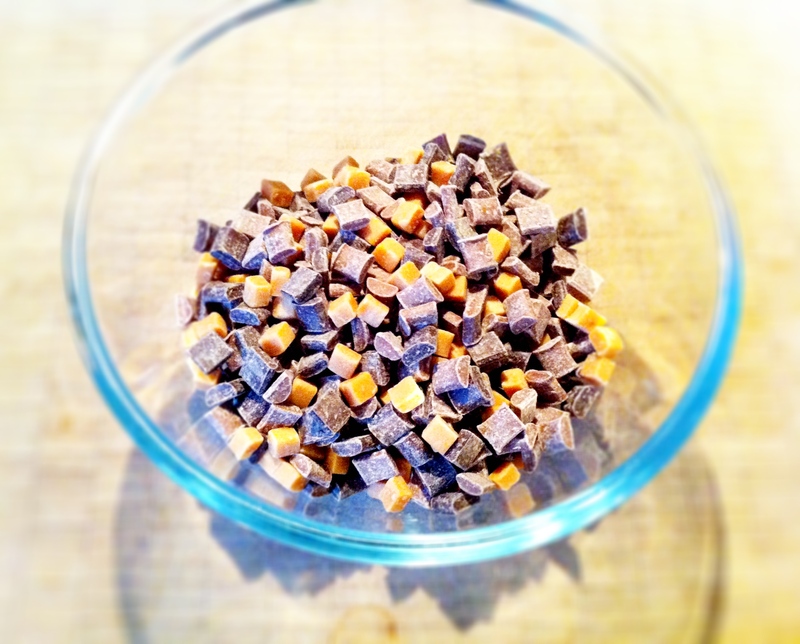 A mix of semi and dark chocolate chips with fudge. As cookies go, they’re also massive in size and one batch produces only 12 cookies. At least the family seemed to like them enough but even my husband, who has a massively sweet tooth, found these too sickeningly sweet. 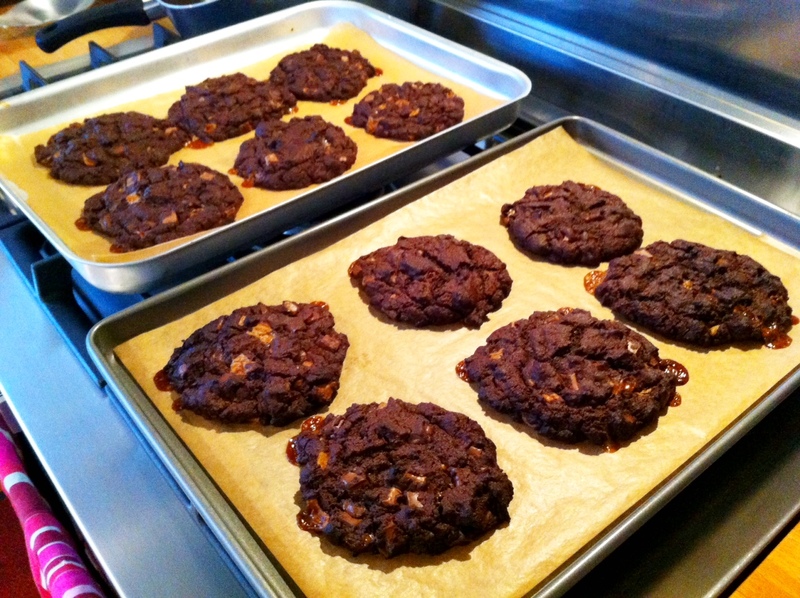 Nigella's recipe makes 12 large cookies. Here's the 'before' shot. Followed by the 'after' shot. See how huge they become??? 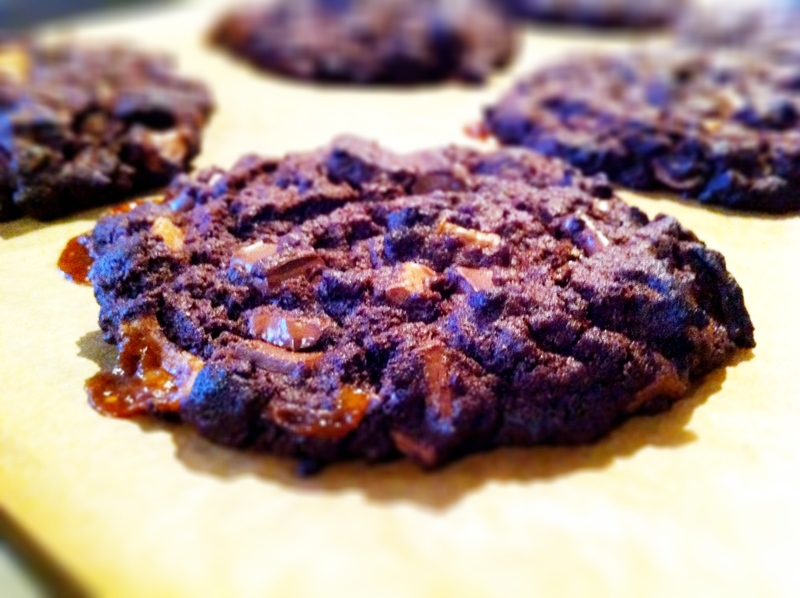 Nigella Lawson's Totally Chocolate Chocolate Chip Cookies. If any of you have a chocolate chip recipe to share, please send me the link. I’d like to get better at making cookies but I’m a bit fussy – I’m looking for something very chocolatey, with a good crunch but also chewy and sticky. Maybe I’m asking for too much? Here’s the link to Nigella’s recipe – the only change I made was to use 100 grams of semi-sweet chocolate chips, 100 grams of dark chocolate chips and 100 grams of fudge. Loved the chocolate flavour but it was way too sweet for my liking. I am sorry there really is no such thing as a cookie that is too large! I find that most cookie recipes today are very sweet as well. It’s such a disappointment when cookies, of all things, come out of the oven and do not live up to expectations. I’ll be anxious to see how people respond to your request. 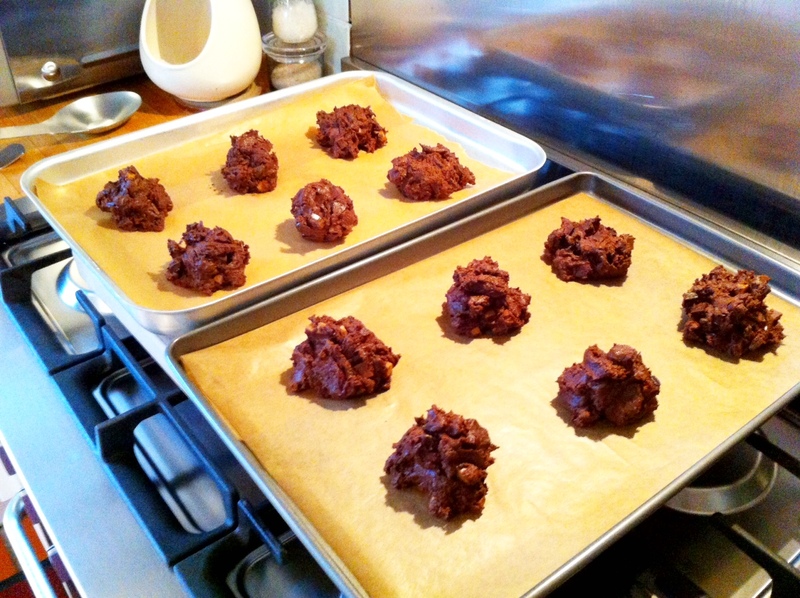 I foresee some awesome cookie recipes coming your way! Cookies are my weakness. Chocolate cookies will probably be my downfall one day. But I like more rich and chewy and not necessarily sweet, so I understand where you’re coming from. I actually made a lemon thyme cookie not that long ago which ended up being not very sweet at all. They were a little dry, but otherwise great – hope you have better luck with your next cookie recipe! Those look super chocolatey! Mmmm! 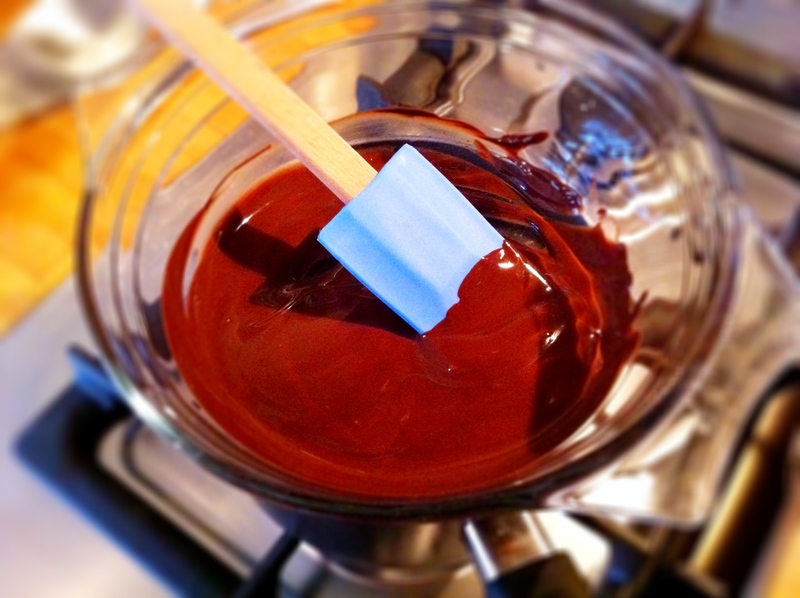 Chocolate Goodness warm from the oven – Yum! It wouldn’t be hard to make the cookies smaller, but if they are too sweet you need a new recipe. I only make the classic Toll House chocolate chip cookie, which doesn’t have a chocolate batter but rather semi-sweet chips in a base made with flour, butter, brown sugar, white sugar and vanilla. I put walnuts in mine, which helps ameliorate the sweetness. If you Google Toll House or “original Toll House” you should be able to find them. These cookies do look delicious. 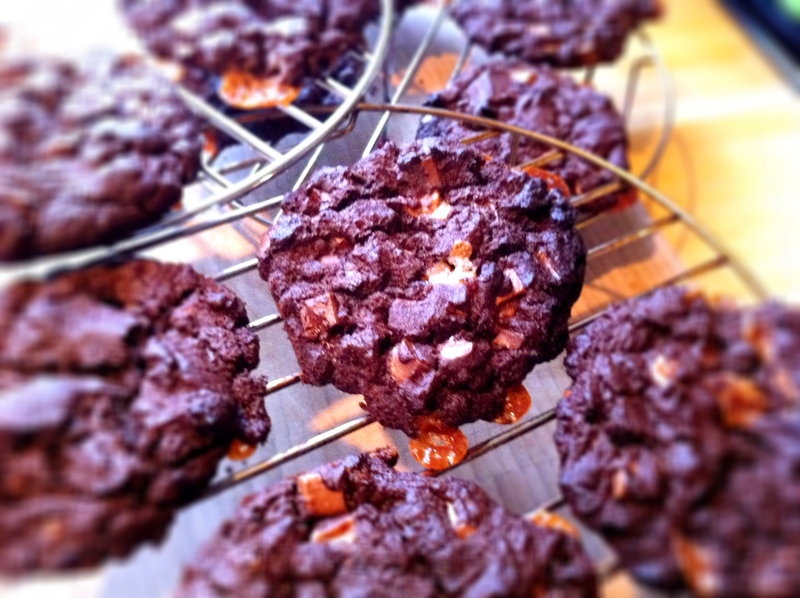 I know I’ve made Nigella’s chocolate mint cookies before and they were as large as these. I think she calls for using a 1/4 cup as a scoop! I think I’m with you here…a little too sweet for my liking. My husband would eat all of those in one sitting – I’d have to make a double batch in the hope of even getting to try one myself! I made these before but used dark chocolate. It was good, but way too rich. hi, these cookies are excellent – but you do have to use dark chocolate(melted in) and dark chocolate chip morsels. then it is actually only semisweet.